You are at:Home»Exact Date Unknown»History of The Word Marijuana & Why We Don’t Use It? History of The Word Marijuana & Why We Don’t Use It? In William Shakespeare’s play Romeo and Juliet (written in the 1590s), the titular character Juliet asks, “What’s in a name?” We answer, “Much is in a name”. Although it is for the same entity that we refer from both “Cannabis” and “Marijuana”, we are in a dilemma which one to use (and which one is offensive). Most people are not even aware of the reason why ‘Marijuana’ is an offensive word. Being in a time when more and more countries are making it legal for even recreational use, it is high time to know the history of the word Marijuana and why we should not use it. That is exactly what we are going to deal with in this article. Cannabis by the roadside, Jiuquan, Gansu. Photograph by Matthew Summerton. Here are how linguists explain the origin of the word “Marijuana”. Some linguists suggest that the word came from the Chinese Ma Ren Hua (‘Hemp Seed Flower’) from the Semitic root “mrj hemp”. The same root gives words like mejorana in Spanish and marjoram (oregano). Also, it is noteworthy that in Mexico, cannabis is known as “Chinese Oregano”. 1937 Marijuana Revenue stamp. Imaging by Gwillhickers. Here we get to know how the word became famous. During 1840 and 1900, even before the Civil War, Cannabis Sativa had a different use, definitely not for recreational purposes. Before 1910, “marijuana” word did not exist, at least in America. Few people knew it as Cannabis which was used only for medicinal purposes. Even pharmaceutical companies like Eli Lilly used cannabis extracts in their medicines. The rich upper-class people, however, were going through the hashish culture. They had already started growing marijuana using feminized cannabis seeds and experimenting with this plant. 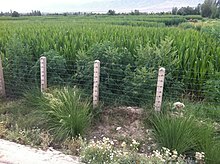 Cannabis field in Sinaloa. Photograph by Cesar.ozunac. In the first decade of the 20th century, there was large-scale immigration of the Mexicans, thanks to the Civil War. The Mexicans already had the culture of smoking weed and they brought the practice with them. For the first time in the history of the US, people conceived the idea of smoking cannabis for recreational purposes. In the 1910s, smoking of ‘locoweed’ was banned in California to regulate the use of opiates and psychoactive pharmaceuticals. This ban, apparently, did not come from the racialized understanding (“reefer-madness”) which caused its complete ban during the 1930s. By the 1930s, the Great Depression had taken place and the Mexican immigrants became the natural and most vulnerable victims for the people who were looking for someone to blame for this devastation. As in any other culture, the native American people started to see Marijuana, jazz music, etc., which came with the immigrants as a foreign substance which corrupts the minds and bodies of low-class people. Just before Marijuana cultivation was criminalized, 29 states out of 57 states in the US banned herb called “Marijuana”. This Marijuana history becomes incomplete without the mention of Harry Anslinger. Many political personalities started opposing Mexican immigrants for the protection of their individual interests. Harry Anslinger was one of those people who contributed to the stigmatized use of the word “Marijuana”. He was the first director of the Federal Bureau of Narcotics, which was set up in 1930. He led a campaign against cannabis. He has given a lot of provocative speeches against cannabis consumption for recreative use. He termed Marijuana as the most violence-causing drug. He also said that only “foreign” people use it and that their “satanic” music and culture comes from using marijuana. Anslinger and his propaganda were the primary ways how the word “Marijuana” became famous among the common Americans. This effort made it more foreign and alien. In the later years of the 1930s, 1937 to be specific, the Marijuana Tax Act came into force as a result of Anslinger’s efforts. It criminalized cannabis plant in every state of the US. And further to discourage the production of cannabis, it imposed a $1 tax on anybody who sold or cultivated cannabis. In addition, all the citizens of America had to comply with a few provisions. Any violation of these provisions would attract imprisonment and a fine of $2,000. No doubt “Marijuana” is more famous than “Cannabis” itself, even in the age of innovative fruity cannabis like grapefruit haze. But we now know that its roots lie deep in racism, politics, and cultural revolution. According to some people, the word ignores (or reminds) of oppression against the Mexican immigrants and African Americans. But some broad-minded people say that it has lost its offensive value. The introduction of the word Marijuana, without doubt, has caused immense magnitude and racial implications, both psychological and cultural. So, the next time you use the word “Marijuana” or even go to buy it, just remember this long history of the word and be cautious about using it. Whether to use it or not actually depends on you and the people around you. We should never deny that the erstwhile Mexican immigrants and other such oppressed people have become the part and parcel of our country and it is actually meaningless to discriminate them based on their past. Question for students: Do you think marijuana should be legalized? Why or why not? Please let us know in the comments section below this article. Cervantes, Jorge. The Cannabis Encyclopedia: The Definitive Guide to Cultivation & Consumption of Medical Marijuana. Van Patten Publishing, 2015. Lee, Martin A. Smoke Signals: A Social History of Marijuana – Medical, Recreational and Scientific. Simon and Schuster Digital Sales Inc, 2012. The featured image in this article, a photograph by Pauk of Cannabis sativa, is licensed under the Creative Commons Attribution 1.0 Generic license.